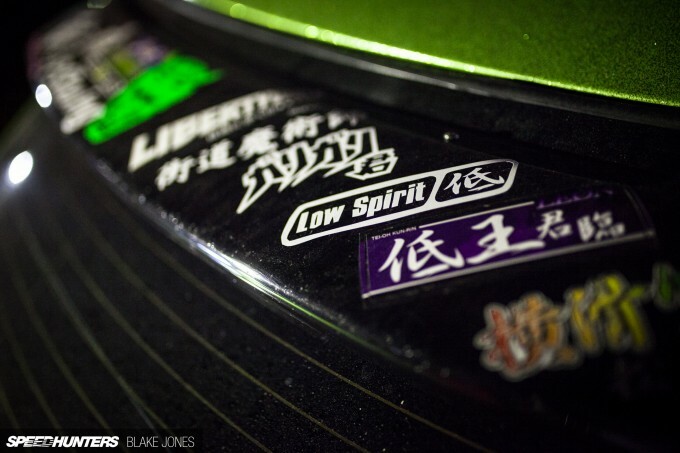 Here at Speedhunters, we love diversity. We concern ourselves with so many wonderful little niches of the automotive world that sometimes it can be hard to give a succinct summary of what exactly it is that we do, and that’s a good thing. 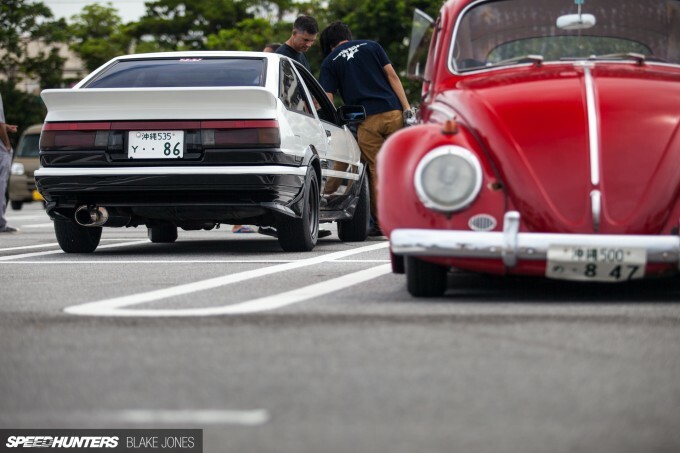 ‘Car Culture at Large’ is a catch-all phrase, but it works. Let’s focus on that c-word – culture – for a second. 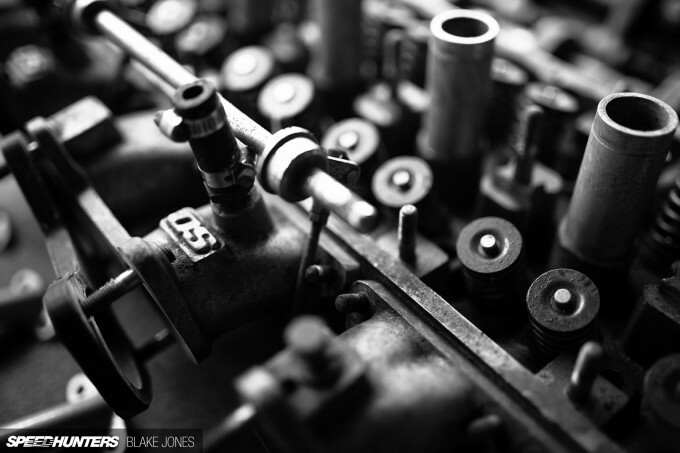 In an automotive context, you might be mistaken for thinking we’re talking about different styles of modification or racing. 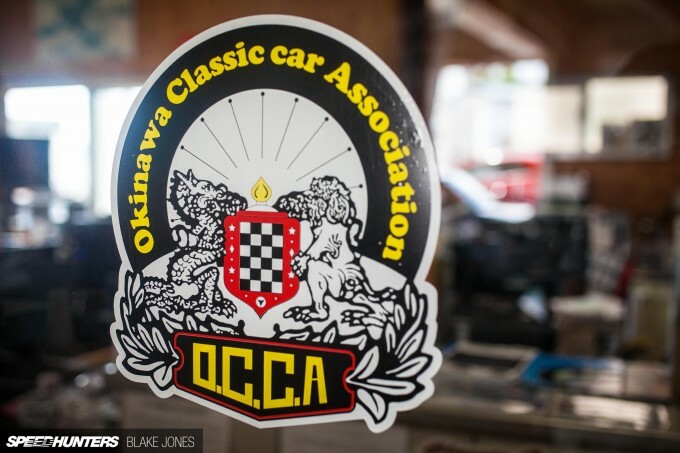 Although my time on the Japanese island of Okinawa was short and almost purely dedicated to the pursuit of interesting automobiles, I found that the car culture served as a window into the storied history of the tropical oasis. 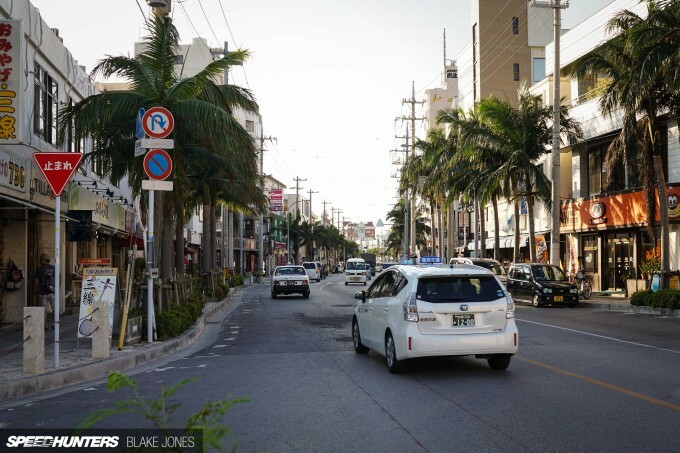 By the time I boarded my departing flight I’d not only been impressed by a rich local car scene, but I’d also had a big lesson in what makes Okinawa so unique. 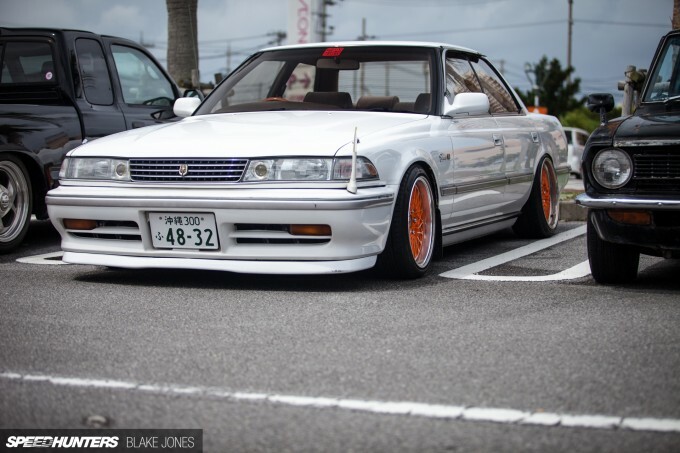 Thanks to Dino and his never-ending stream of awesome content from Japan, I’m going to assume that most of our readers have a decent understanding of the Japanese car scene. 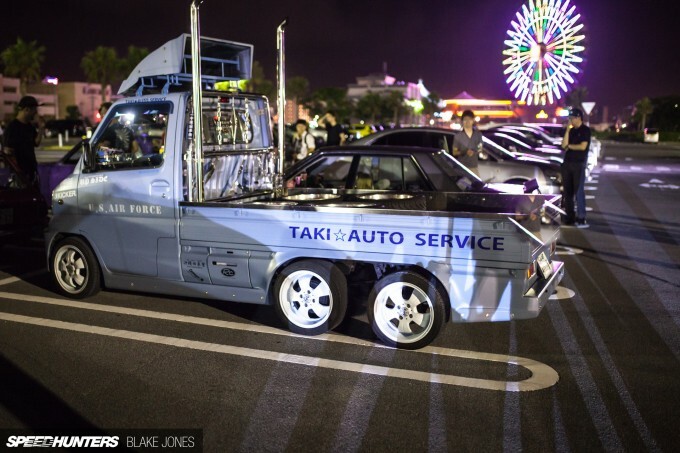 Collectable classics, slammed drift sleds, tuned touge monsters, Kei cars, and the always present ‘WTF?’ factor – yeah, Okinawa has it all. Hop on a jet from Tokyo and point yourself south for three hours and you’ll arrive at Naha Airport. If you’re anything like me, what comes next is a sense of mild confusion because although your destination says ‘JPN’, your surroundings would suggest otherwise. The air is warm and sticky, almost every sign is in English and the mainland’s ethnic homogeneity is a distant memory. The only people that look Japanese are those who disembarked from your flight from Tokyo. You look outside and see blue ocean stretching towards the horizon, as a USAF F-15 launches itself down the very runway your Boeing just landed on. Step outside the terminal and the story is much the same, however the sight of a Toyota Crown Comfort cab and at least 30 Priuses (officially, Prii) reassured me that we are actually still in Japan. The architecture, foliage and general vibe is much closer to South-East Asia than typical Japan. I couldn’t resist including one holiday snap – just look at the colour of that water! There’s good reason for the unique vibe too; this string of volcanic islands for most of history was separate to Japan as part of the Ryukyu Kingdom, having its own ethnic identity, language and customs. To slightly compress history, Japan aggressively claimed the territory in the early-1600s until everything was turned on its head by the events of World War II. 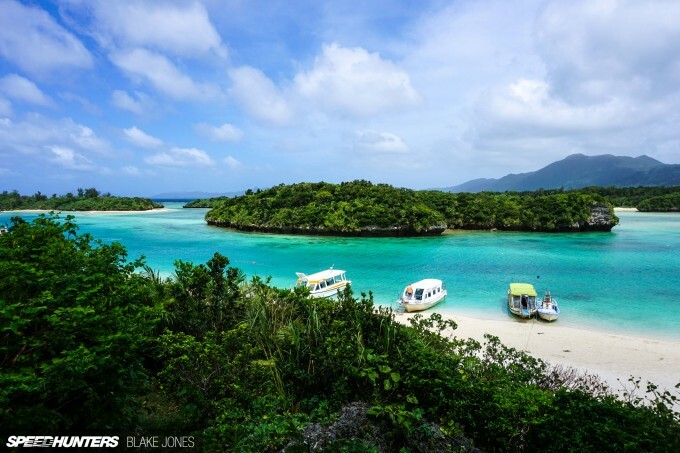 After the war, Okinawa became a hub for the US military and remains so to this day. Walking through the lines of cars during a Friday evening gathering at the regular meeting place – a sprawling carpark situated next to the aptly named ‘American Village’ – there was an obvious divide between the Japanese and American attendees in terms of language, but the common language of cars was being spoken fluently. 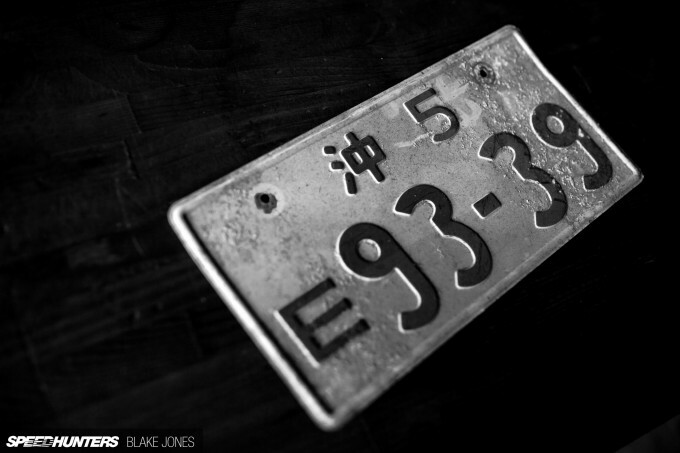 Even the registration plates in Okinawa tell a rich story about the island’s history. Pictured here is an original Oki-Go (Okinawa, 5) plate which was issued in the late-’40s. The ‘E’ marking to the left designates that this plate belonged to a left-hand drive vehicle imported from the US, so there’s a good chance this would’ve been mounted to the front of a US officer’s pride and joy, shipped straight from Detroit! Car enthusiasts are probably the only people in the world who would complain about living on a tropical island, but the reality is that the humid climate and salty ocean breezes are a classic car’s worst enemy. 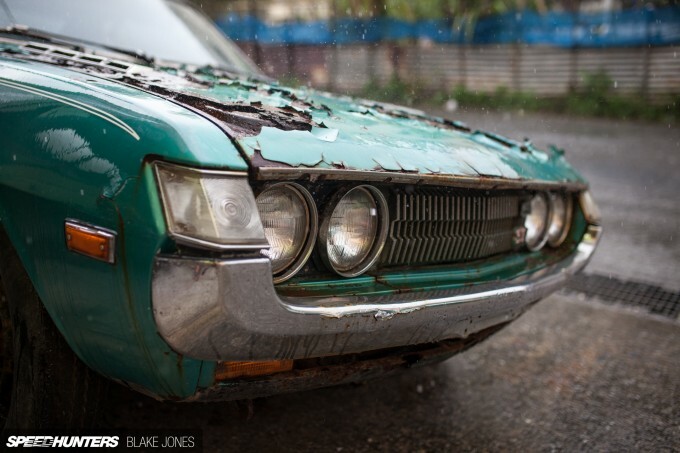 You don’t have to look far in Okinawa to find rusted-out hulks of metal. Owning a classic here takes a serious disregard for one’s sanity, and probably causes some level of subconscious anxiety at the mere sight of a storm cloud. On the subject of classics, one stop on the agenda was to a nondescript warehouse within an equally nondescript residential suburb. 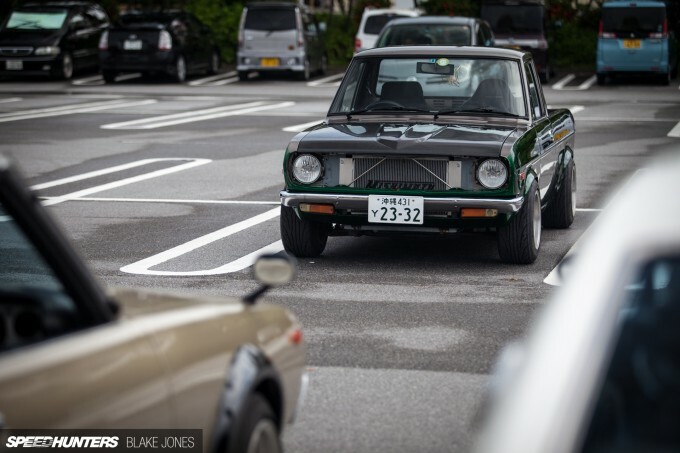 Of course, this being Japan, one can never be too sure what hides behind any closed door, and in this case, the surprise was an extremely eclectic collection of vintage Toyotas. What made this collection so notable is the owner’s goal – to collect not just one example of each Toyota vehicle but a perfect pair – one in each left and right-hand drive. Don’t mistake this for simple Japanese eccentricity, as once again this is an instance of cars telling an interesting story about culture at large. 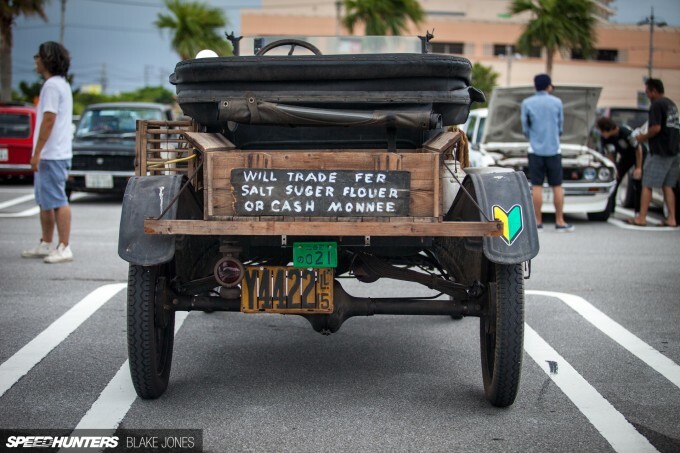 On account of Okinawa effectively being a US territory until 1972, cars were driven on the right-hand side of the road, as per law in the States. 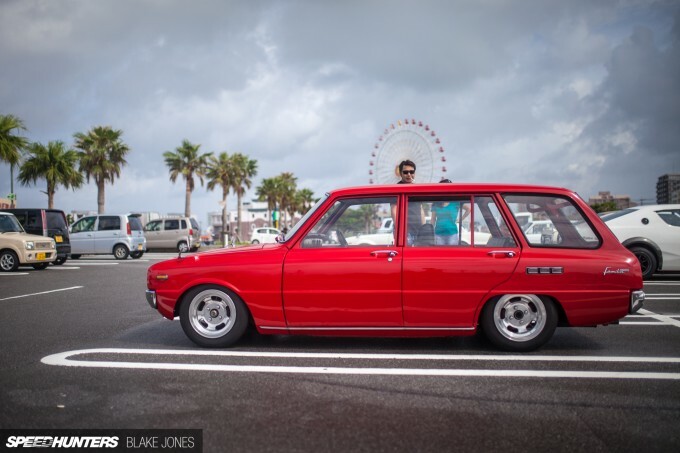 As a consequence, manufacturers produced small numbers of Japanese-only models in left-hand drive for Okinawan owners. Today these examples are exceedingly rare, and this particular collector has turned to the US to source left-hand drive examples for his collection. 730 (Nana-San-Maru) Day is commemorated around the island as the day traffic changed back from the US-system to Japanese-style in 1978, including a colossal effort to change all road signs and signals in the prefecture within a timeframe of just eight hours. 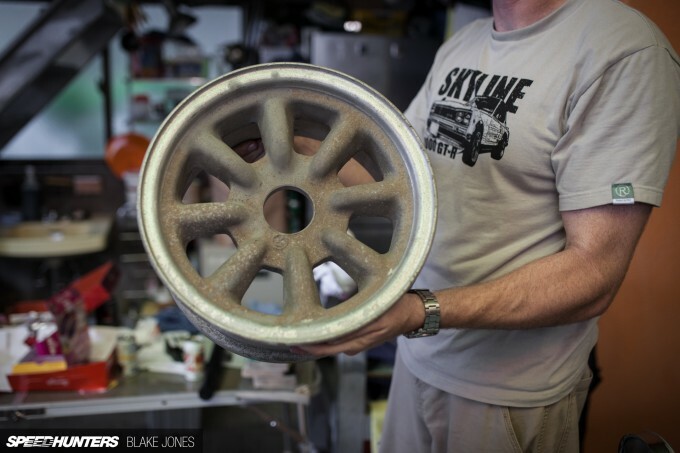 Any serious collector has an equally fanatic penchant for rare parts as he does rare cars, and this was no exception. 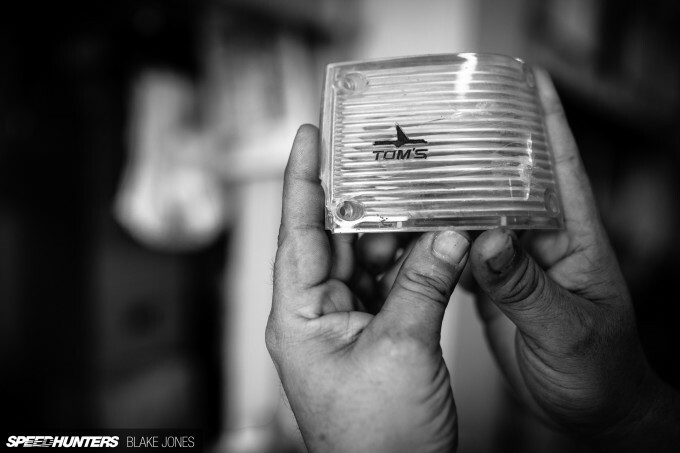 I have no idea what this TOM’S lens belonged to, but suffice to say it was rare. 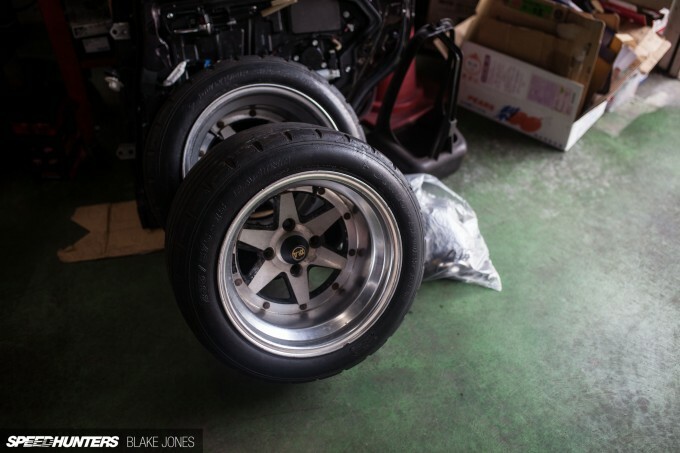 Or how about an original RS Watanabe wheel? Look closer and you’ll notice these are undrilled, meaning they’ve never been mounted to a car before. 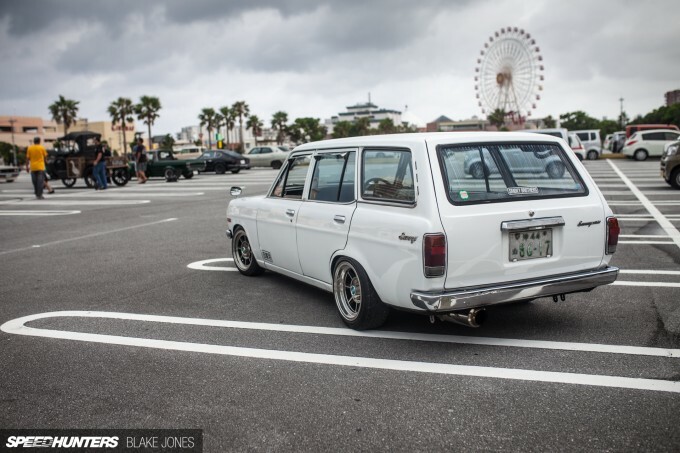 Here’s something more modern but equally quirky – a coach-built Toyota known as the Origin. 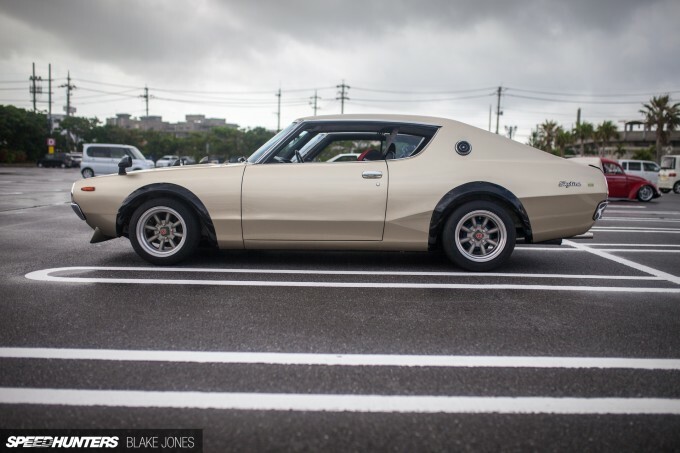 Suicide doors, a 2JZ and a production run of 1000 vehicles – what’s not to love? This is begging for the VIP treatment; just look at those front seat doilies! 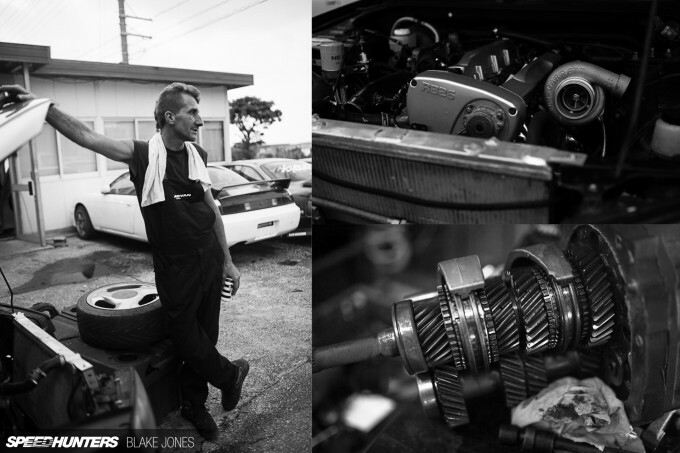 Elsewhere on the island you’ll find guys like Bill Siekert of B&M Okinawa, an ex-USMC man who knows how to build a mean RB26. 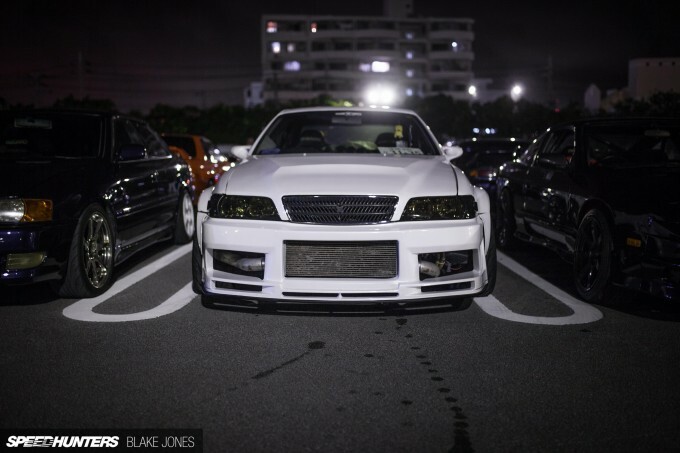 He’s a go-to for any Nissan enthusiasts hunting down spares or performance parts. Bill is also the supporting force (read: dad) behind a brother/sister drift team that competes in matching S-chassis machine on the mainland. I couldn’t help feeling this was a real-life Need for Speed story just waiting to be told. However, I have to save my favourite find on the island to last. 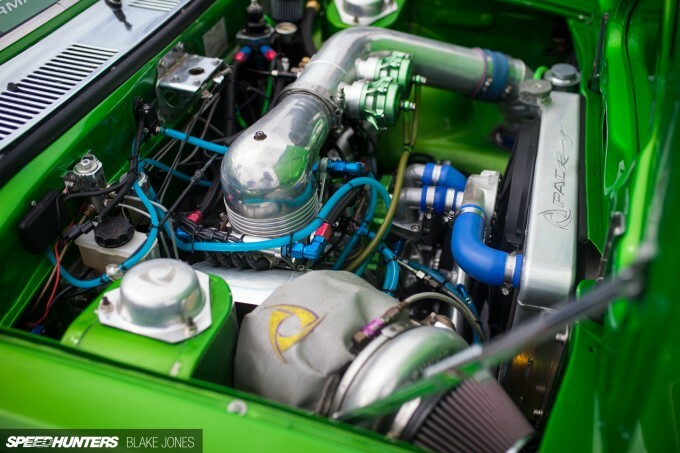 When this gloriously green RX-3 emerged from its storage garage in front of me I was doubting my own sanity. Had I really just flown 14 hours, only to be presented with a car that literally defines a whole era of rotary tuning and racing in Australia? Apparently so, because the owner of this car, Ken, is a rotary nut and has a strong relationship with Pac Performance – Australian sport compact drag racing royalty and the Sydney-based workshop responsible for this build. 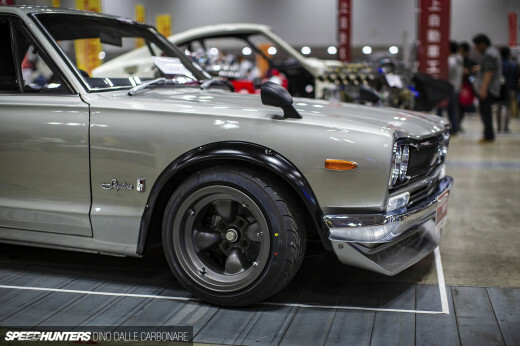 Retina-melting paintwork aside, the team at Pac does know how to boost a rotary. 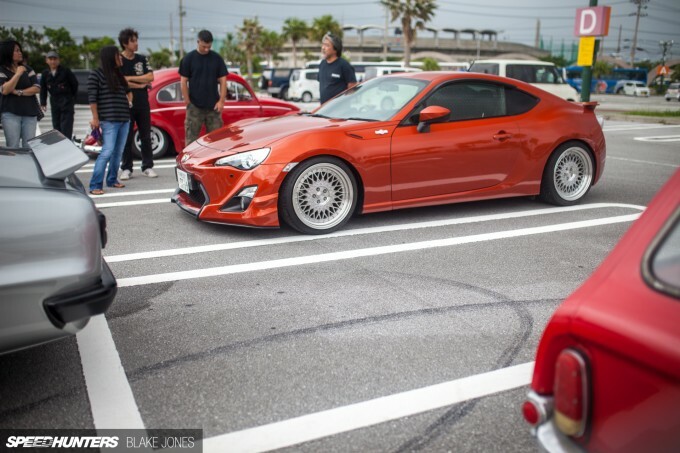 An output to the tune of 700hp guarantees that Ken makes his presence known when this car is started. 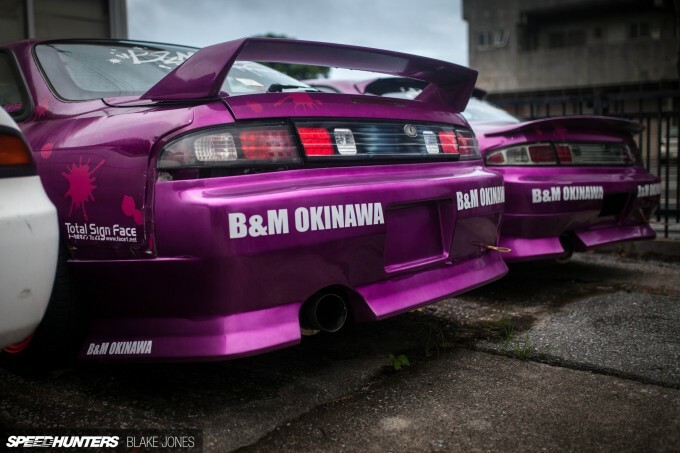 You may remember my story on Ken’s 500hp drag FC3S, which he’s using to reinvigorate the Okinawa drag scene after the island’s only drag strip was closed; let’s hope for an update soon. 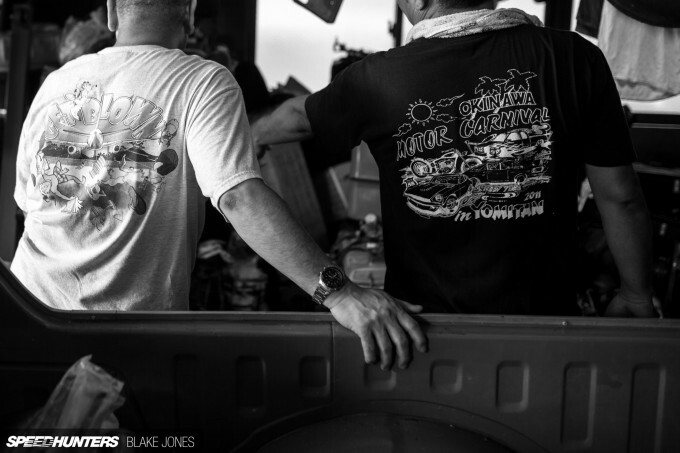 Through the foresight and organizational skills of my two extremely accommodating accomplices Eric and Leon, a small gathering of Okinawa’s finest classic cars had been arranged for Sunday morning. Considering that rain clouds had been dumping on the island for three days straight courtesy of a passing typhoon, I was absolutely stoked to see about 30 cars roll up. 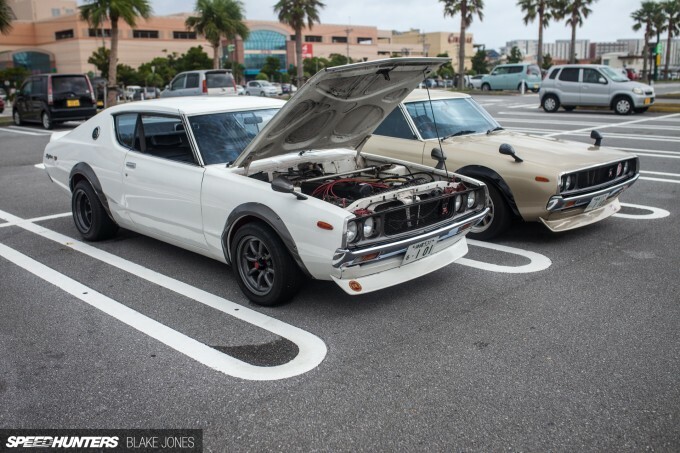 I didn’t waste any time in acquainting myself with the two Kenmeri Skyline GT-R replicas that parked up either. 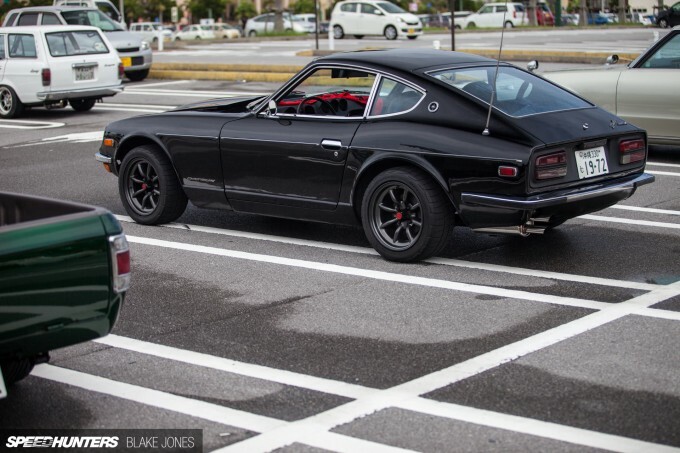 This is without a doubt my favourite classic Japanese car, and although the bolt-on flares and RS Watanabe wheels look might be a well-travelled route, it just works so incredibly well. Speaking of timeless Japanese designs, we were joined by a lone Hachiroku resplendent in two-tone panda paintwork; once again RS Watanabe providing the perfect complement. 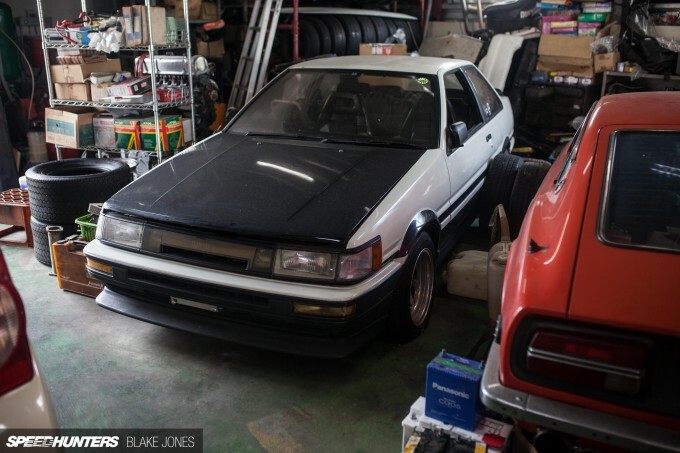 It fascinates me that Toyota effectively offered four different versions of this vehicle in the mid-’80s, depending on whether the buyer wanted a Trueno or Levin front-end matched with a notch-back or lift-back rear. Compared to the night meet from earlier in the week, both the owners and cars that turned out on this morning had a few more years under their belt. What was consistent was the fairly even mix between the locals and the gaijin, although most of these guys have been here long enough to shed the foreigner title. I’m told that there’s a fair proportion of military guys who fall in love with the island (and usually a girl too), and make Okinawa their permanent home. Living here and tinkering with a classic to pass the time does seem like a pretty solid life plan, to be honest. 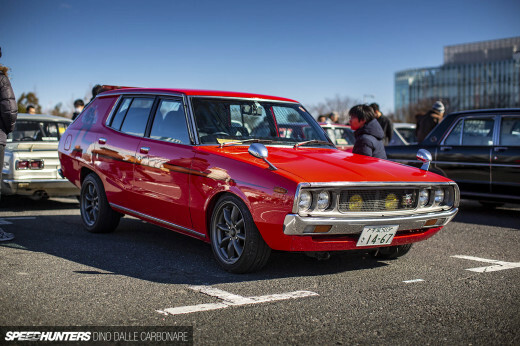 The intense red lacquer on this Mazda Familia wagon brought me back to the present day. This car was still piston powered when shot, but expect that to change soon. Setting a different pace altogether was this immaculately executed Mark II cruiser. 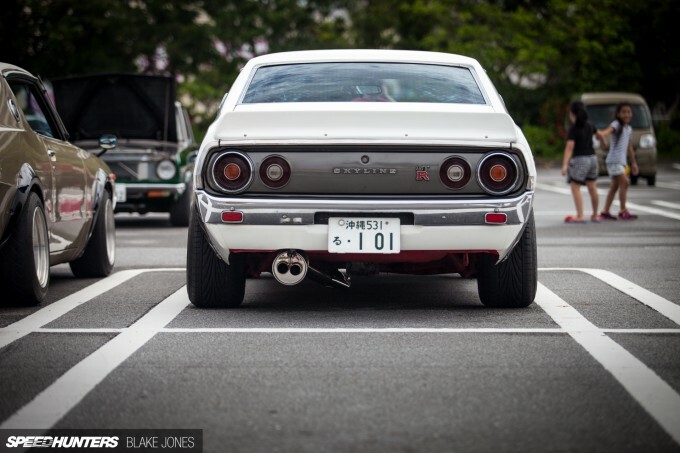 You may remember this beefy rear fitment from my feature on Eric Auburg’s Hakosuka Skyline. 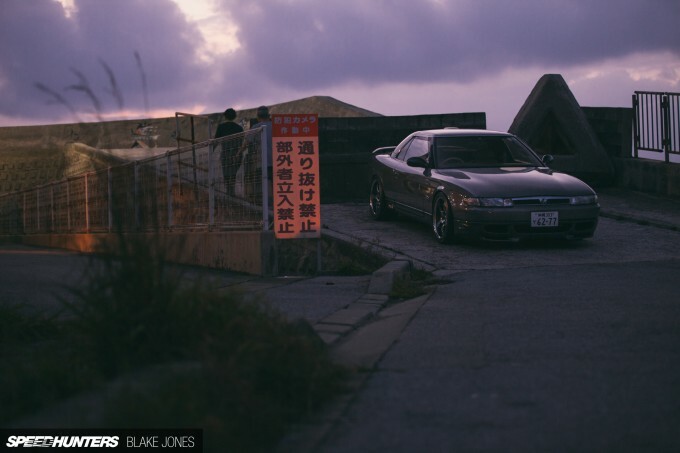 Eric’s journey with his GC10 is another example of a match that could only come about in Okinawa, and well worth a read if you have the time. 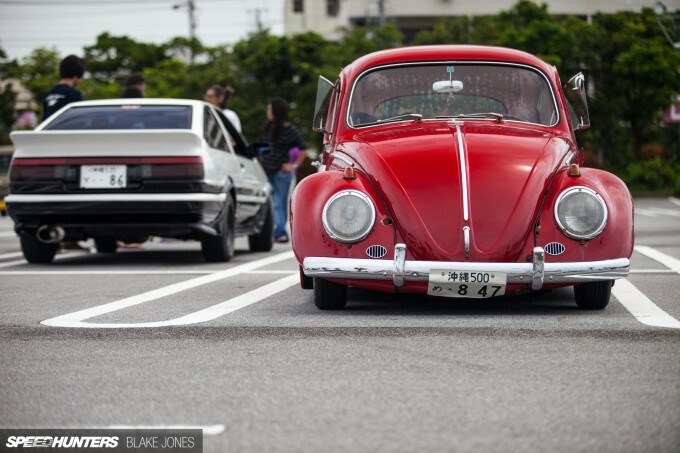 The Japanese classics are undoubtedly the dominant flavour for the island’s old school enthusiasts, but this pavement-scraping custom Beetle made a strong showing for the European contingent. The dreaded rust was taking a decent hold in some of the panels, but I think we can let it slide for such a handsome cruiser. 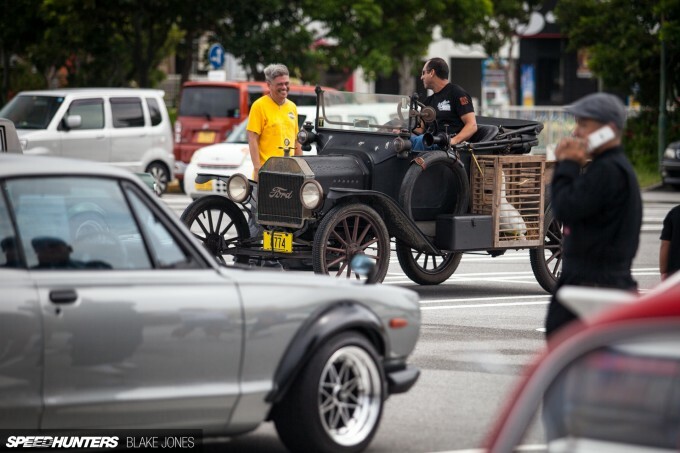 As a final celebration of crazy automotive culture blends, I present this Wakaba-wearing Model T Ford, complete with period signage and flank-mounted goose cage. 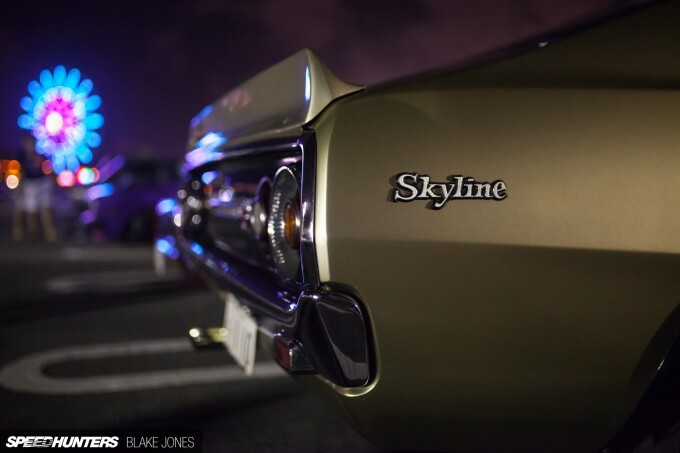 Many cars claim to turn heads, but I’m fairly certain this one takes the cake – even at a gathering like this! I have to finish by saying a huge thanks to Eric, Leon and Tom for showing me around this amazing little island! 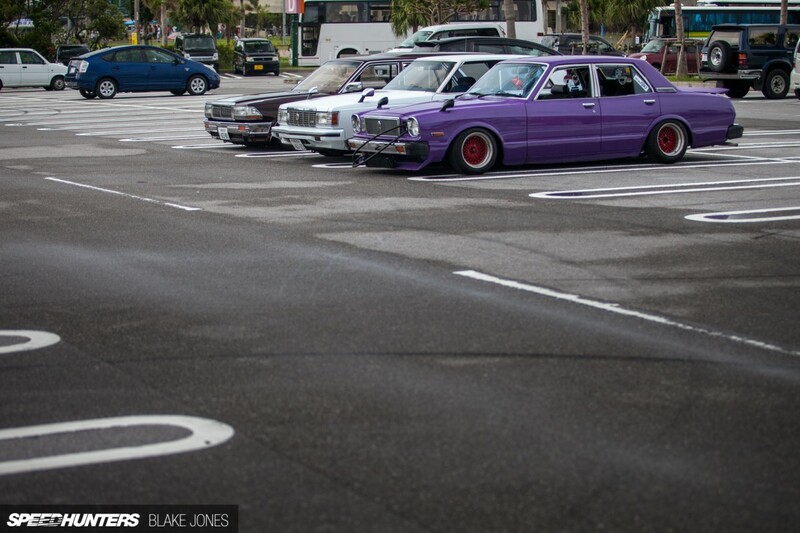 Okinawa car culture seems like such an off-shoot of mainland Japan car culture... It's similar, but so different at the same time. Very interesting. 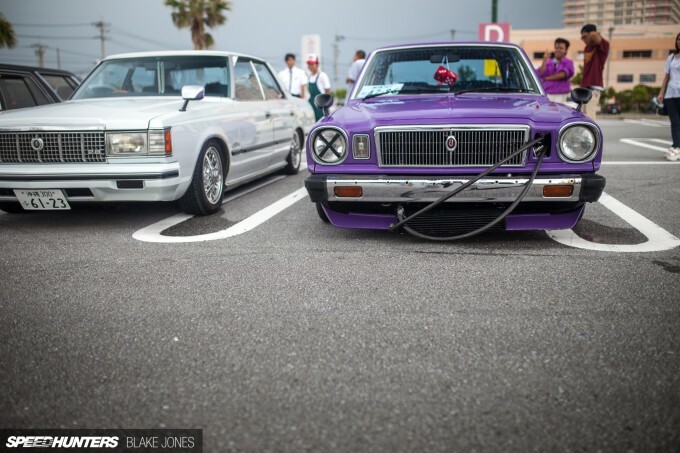 More of that Toyota Century re-make please... I love it!!! Whoa, I basically grew up here. Really cool to see this article. I miss that island so much. Some of those cars I'd never seen before and some of the owners I have actually met. Maybe one day I'll find my way back. Damn, that cosmo looks awesome! 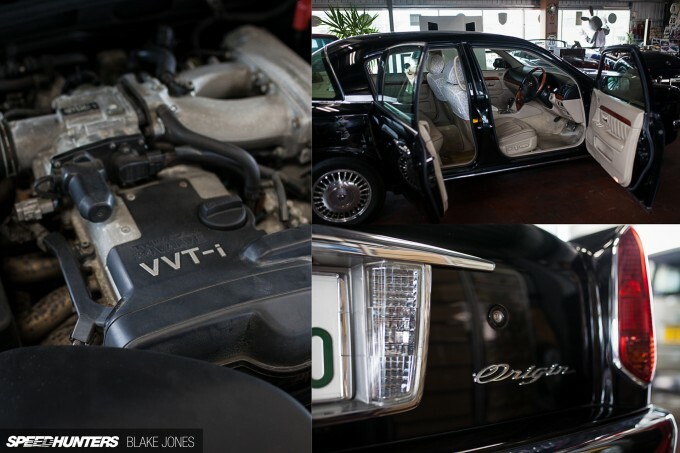 John Key NZ That's actually a Toyota crown Royal Saloon 2800 (ms112). 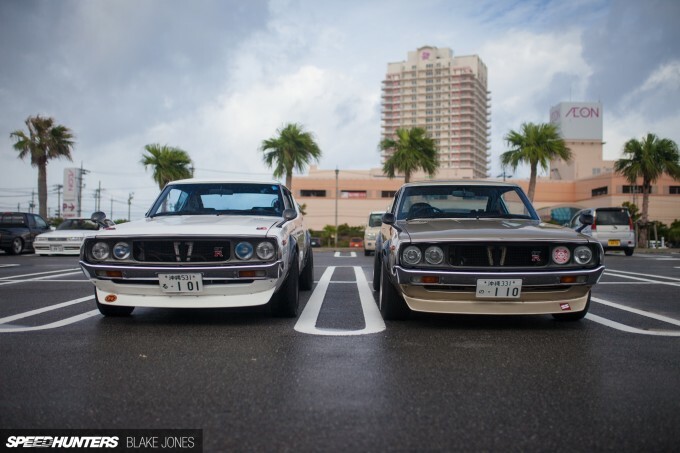 What makes it look like the century is the jdm front and rear. 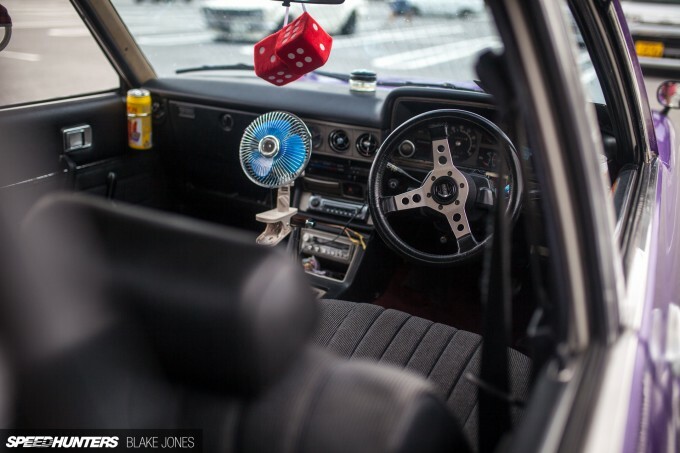 Dash is also unique for the jdm version. Nice collection of cars. Especially the white Royal Saloon Crown and mark II cruiser. Okinawa was a fun place to be, however as an American who served in Okinawa I am ashamed about how incredibly poorly we treat them. Its time for the marines to leave, the Okinawans deserve to receive better treatment from both Americans and Japanese. Hey I live there! I've had to pick my jaw off the floor a few times seeing many of these cars in person. 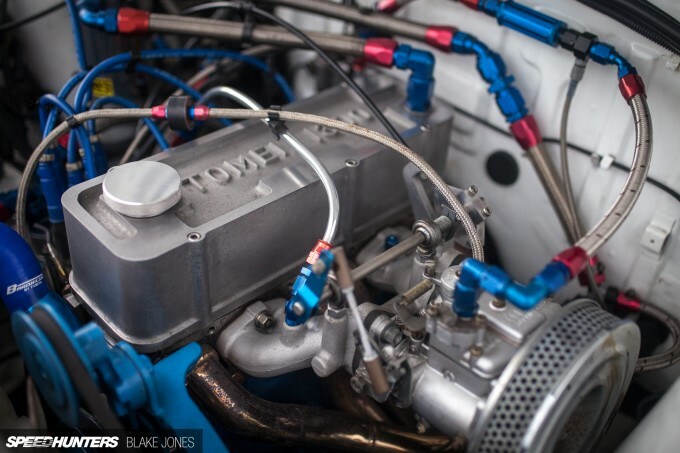 That TOM'S lens is for the non-'slant nose' 1st generation Celica's - JDM TA22, TA23, TA27, TA35, RA25, RA28... etc. jwtnssn You speak of things you know little of. Trust me there are motives behind misinformation you are given. I was born and raised there for 31 years. There is huge corruption involved in Okinawa. A complete rouge , facade, fabrication of what they are trying to accomplish trying to acquire. I remember that RX3 when it was for sale, would have paid a pretty penny for that.....it was one of the more expensive ones quite a while ago. Nowadays it'd be considered cheap seeing what the "RX3" clowns are asking these days for very sub-par cars. 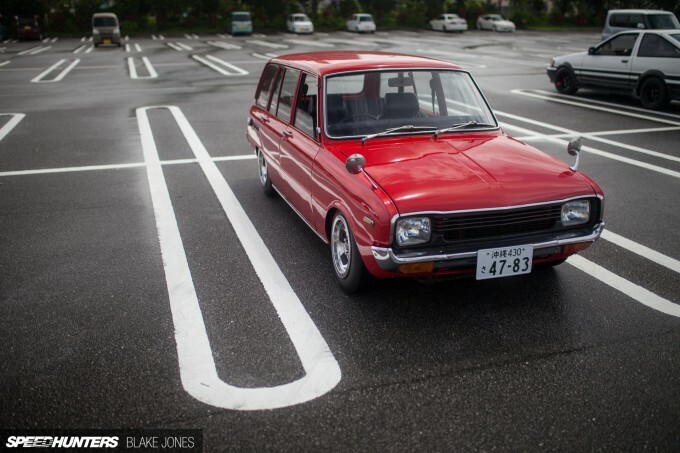 Little red wagon is mad as, sits very low! 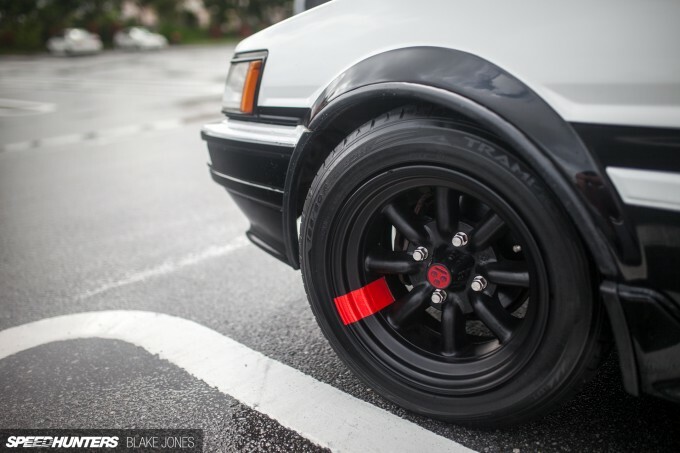 What's up with the tape on the wheel? Does it serve a function purpose or someone just thought it looked cool? I've seen this a few times lately. turboboxer6spd The tape is used to keep the wheel weights from ejecting at high speed. It's an old school trick. 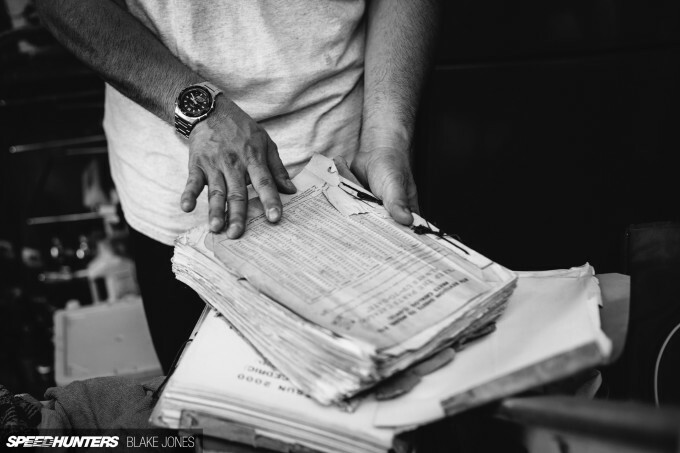 Great story and photos!! 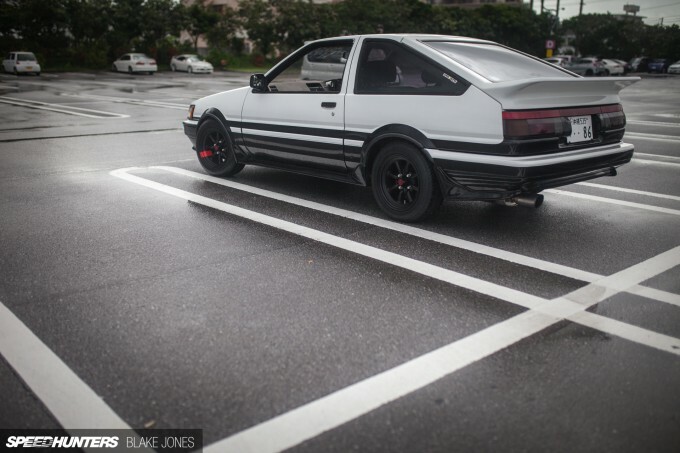 The spoiler on the panda 86 is the most aggressive I have ever seen, it's perfect! There's a 1/8th mile drag strip on Izena, a small island about a 50 minute ferry ride from Motobu Peninsula. We've been drag racing there for two years (since Nago racing circuit closed). I haven't been to Oki in 14 years. Thank for this article. I live on the mainland now but I might have to take a trip down there again soon. Been on Okinawa goin on 30 years. Nice to see our little slice of paradise get some coverage. If you want to see more classic American Muscle, you should have hit up the OFP boys near the Futenma temple with their tricked out 20s and 30s era Fords. 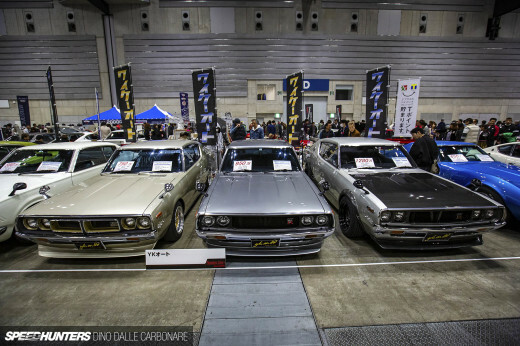 They also have some classic Japanese cars. You hit the nail on the head about car guys only gripe is the salt air. 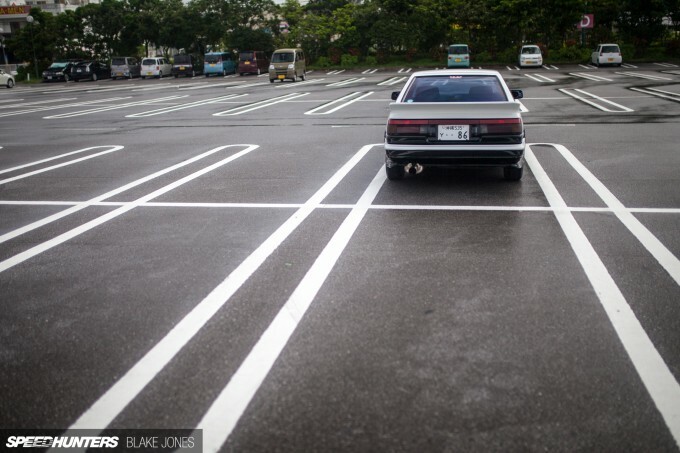 I am on my 16th AE86 and it is a constant chore keeping the body under control. Living here forced me to learn bodywork and paint, But I would want to live anywhere else. Hey Blake great job mate. Good to see okinawa getting some love. I went there for a visit 2 years ago. I now live in Taiwan. 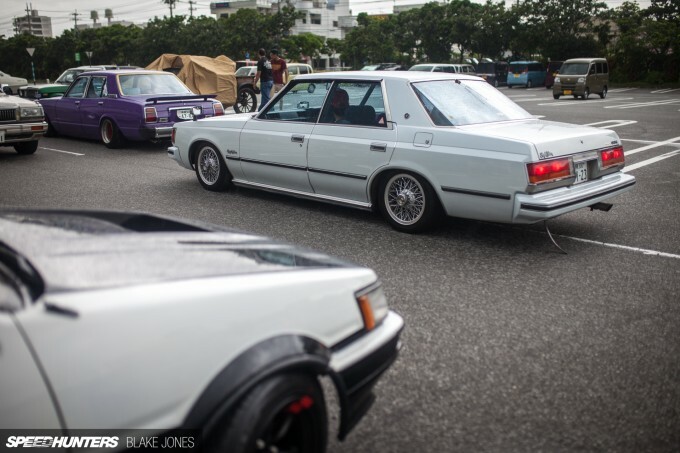 I own nissan sunny truck 1992 LHD, I'm wondering if that collector has one? Could I get his info?? I dunno who told you that the single kanji Oki plates were from the 1940s, but they are wrong. Those Oki plates started in 1972 when we gave Okinawa to Japan. I've had to pick my jaw off the floor a few times seeing many of these cars in person. It's similar, but so different at the same time. Very interesting.